Hey you guys! I hope you’re having a nice weekend! Today is Sunday, my favorite day of the week. It’s the day we set aside to honor and praise the Lord (we should do this every day, but it’s also good to have special time set aside for it 😉 ) and a fun part of that is wearing something nicer! Katie and Meg are both wearing pretty church outfits! Take a look at them and vote in the comments for which one you like better! Let me know what you think!!! In one week I’ll announce the winner who got the most votes! I’m so excited!!!!!! Last week, I ordered an outfit from AG that I found for half price! It should be here any day… but I’m not gonna tell you what it is yet. You have to guess! Here are the choices! There you have it! Tell me in the comments which one you think I’m getting and you’ll find out soon! It’s been a week since I posted “Getting Artistic with Alex!” so now it’s time to see which photo got the win! Ready? #1 got a total of three votes. 😀 It was a close one! Thanks so much to my voters! More fun coming your way soon! You have one week to vote! Can’t wait to see what it’ll be! I hope you’re having a super Thursday. While we wait to find out what #65’s name will be, we’re gonna take a look at what I’ve been up to and get your feedback! I love taking different pictures of my different dolls in different outfits with different backgrounds, but sometimes I just want to do something, well, different. I’ve been trying to get more artistic with pictures by using angels that are… different! I’m gonna show you two recent photos of Alex and I want you to tell me which one is better! In one week, on October 13th, I’ll announce the winning picture! #65 is very pretty! A lot of AG’s “red heads” are actually more strawberry blonde, so I love that her hair is darker. #66 has the Josefina face mold, instead of the overly-used Classic mold, which makes her a little more unique. Her eyebrows are a slightly different shape, too! Both of them have a fairly common hair/eye color combo, so I think AG could keep getting a little more creative, however, they are gorgeous dolls! Now tell me which doll you like better! I’ll take a vote over the next week to see which of these two is more popular. Comment “red” to vote for #65, or “brunet” for #66. The results will be up on October 4th! I’m thrilled to have this blog up and running! It’s pretty self-explanatory. 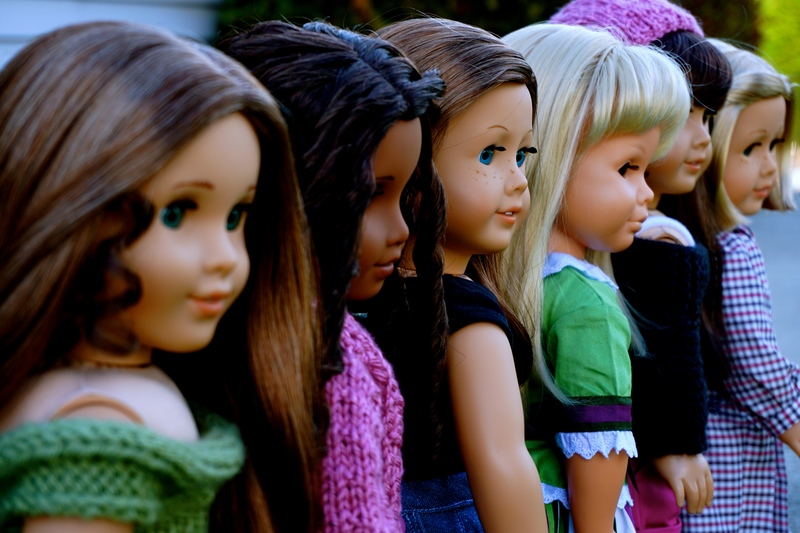 This is a place where you can play, voting and guessing on all American Girl doll stuff! To find out more, visit the “about” page. You will also see you can meet me and my dolls. 🙂 I hope you stick around for the fun!